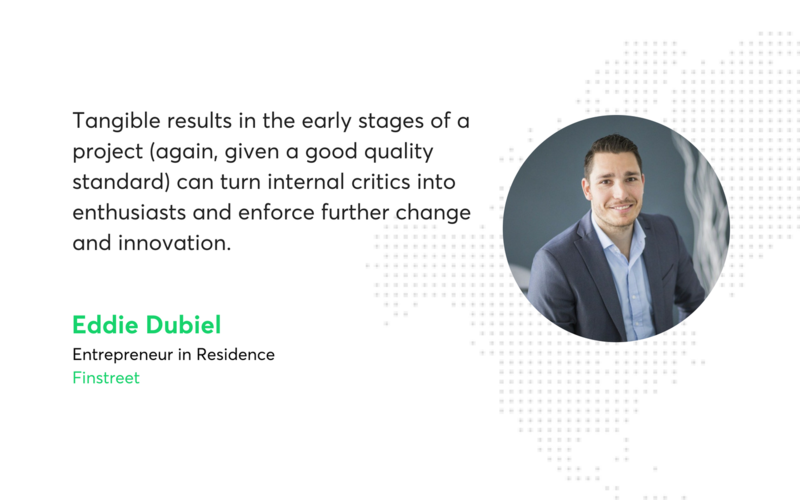 We’ve talked to Eddie Dubiel, a representative of Finstreet, about the future of one of their project, the difficulties of operating in the highly regulated German financial sector, and about bringing innovation into large fintech organisations. The insights we gathered shed light on doing business on this highly desirable and competitive market. Netguru works together with Finstreet on two concurrent projects, but the focus of this article is on one of them. The project belongs to one of the largest banks in Germany. The client decided to build a software accounting tool for small and medium organisations. The tool helps businesses save time and minimise the costs of accounting, while also providing valuable data about the users to the client. The client preferred to remain anonymous. What is the strategy behind this project? What are its main goals and what’s going to happen in its near future? The product could be just like any other simple accounting software (and there are quite a few of those on the market). However, it differs from the competition because of its origin, since it was developed by a bank. The client has come to the conclusion that in order to retain customers in the future, a bank needs to do more than just provide banking products – it needs to provide added-value services that matter to its customers. By helping small to medium business clients get through their daily accounting workload, this product makes life easier for businesses, while collecting valuable data the bank can use to produce and provide better and more suitable financial solutions to its customers. The first step in the development process was to build a Minimum Viable Product (MVP) to meet the minimum requirements of a small group of business clients. By introducing the software to the market, we challenged the product-market fit as well as the sales processes that are involved in the cooperative banking sector. Based on the experience and feedback received at this stage, we want to expand the functional scope and push to roll out the product to a larger market segment. Why the focus on small/medium companies? Is there a lack of a similar product for them on the market? What makes this product unique? The market for simple-to-use accounting software is very much dedicated to smaller companies, since larger companies have a professional workforce to meet the accounting demands. Several companies compete on the market that our product is entering. We’re unique because of the business model driven by a bank. 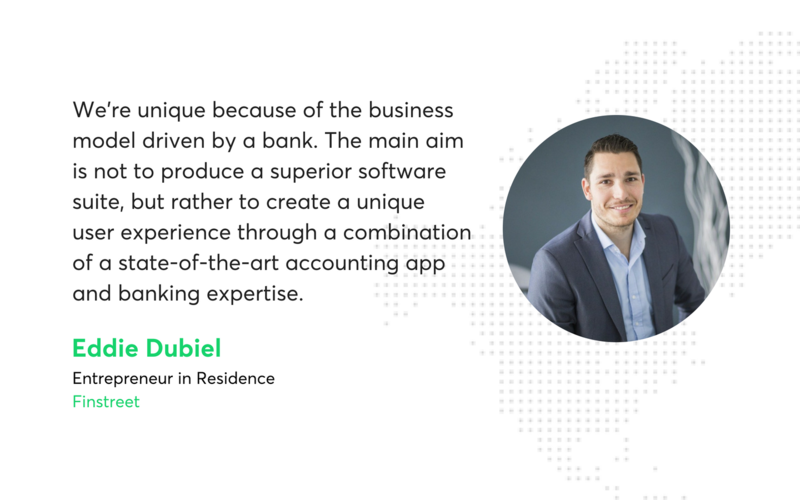 The main aim is not to produce a superior software suite, but rather to create a unique user experience through a combination of a state-of-the-art accounting app and banking expertise. What challenges did you face when building the platform? The most challenging part of building such a specialised application in the form of an MVP was the question: what do potential users really need? Answering this question was not easy but very important, because not everything that sounds like a good idea at first glance will also be interesting for the users. We’re searching for functionalities they will use every day. It is key to keep the ratio of the important features and the time frame under strict control. Tight schedules usually don’t leave much room for moving in the wrong direction. Another challenge was to provide and test the functionality and user experience of the platform on all sorts of end devices and different web browsers, because the users of such an application don’t want to be bound to a specific device or location. How do you make sure end users feel safe when interacting with your platform? One of the obvious security mechanisms for end users is automatic logout from the system after a specific period of idle time has passed. Another is using encrypted connections not only for the application itself, but also for related services such as the landing page. Furthermore, the hosting provider we are working with has a lot of experience with sensitive data, fintech and banking systems in general, and the client’s brand is well-known to end users and generates trust as well. Are corporate clients usually open to technological innovation and digitalisation? How can you convince those who aren’t? Openness to innovation has two sides: one is the organisational aspect, the other one is personal. To be successful in the race for digitalisation, both the organisation and its employees have to have an open-minded approach to innovation. On a personal level, we usually integrate people in the development process, e.g. in testing. People get enthusiastic about innovation if they can “hold” it in their hands. Furthermore, we help people feel good about working on the project by drawing the “big picture” they are part of, by focusing not only on content but also on the way we provide information. Finally, it helps to make future results “tangible” in early stages, e.g. in the form of mockups. For an organisation to be open to innovation, it needs the board to live in accordance with the values of innovation. If that is not the case at the beginning of the project, we focus on the pain points of the relevant people who will be highly affected by the change. What should be the priority when working with large organisations? How important is building trust in the financial sector? Our understanding is that trust is key in any relation, also in the relationship with customers. Trust is built by reliably delivering excellent results. To make innovation work for more “traditional” thinkers, we have to reliably show that the project will continually deliver progress that will not harm the achievements of the past but instead bring new and necessary improvements and advancement. Do you believe that innovation is possible and viable in large organisations? Innovative thought is definitely possible in larger organisations. The main issue is the time it takes to implement innovation. By having to respect existing processes, structures and lines of communication, innovation in larger organisations tends to get “procrastinated”. 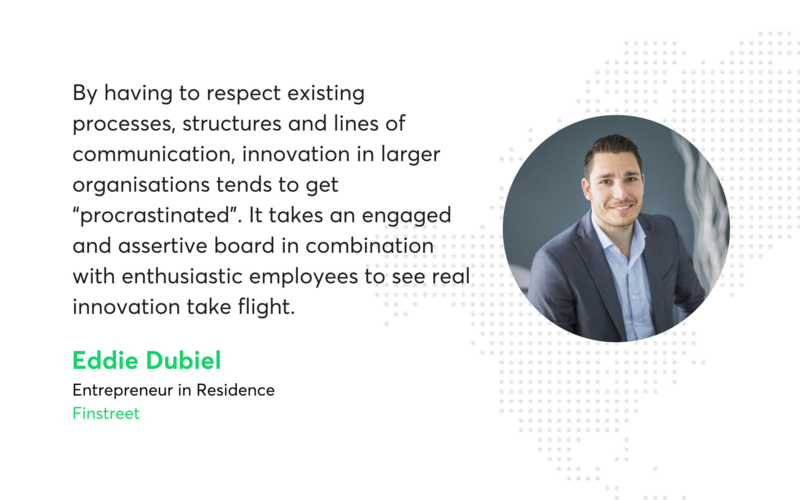 It takes an engaged and assertive board in combination with enthusiastic employees to see real innovation take flight. What does it mean to introduce innovation to large financial institutions? The financial sector in Germany seems – to a large degree – to have realised that there is undoubtedly a need for innovating the banking process and the user interface for customers. Once a financial institution comes to the conclusion that digitalisation is a change that needs to be embraced rather than repelled, the first step to innovation has been made. Taking the whole business model into consideration with our comprehensive knowledge of the financial sector. Digitalisation brings slow but drastic development to mature companies, and so we make sure that our projects not only result in technological products and theoretical business models, but that during the course of the project, all the people involved embrace our mentality of digitalisation and sustainably drive change within the company. What makes the German market specific in the context of building this type of innovative products? The context is certainly much more affected by the customers than any characteristics of the country. For building the products, only the legal framework sets specific boundaries that are unique to Germany. However, in the case of accounting software such as this one, the legal framework does affect many facets of the product. How do you deal with corporate structures and legal restrictions? For both the constraints of corporate structures and legal restrictions, our key strategy is to accept their existence and to focus on the opportunities they leave open regarding the customer and the product. For instance, corporate structures certainly may slow down the innovation process. However, due to necessary coordination loops, these structures also provide security along the highly dynamic process. If given the right tasks, each member within the corporate structure provides valuable capacity. Also, legal restrictions in some cases show you the (perhaps only) way in which things can be done. There is no value in arguing against restrictions that will not change anyway. Is speed and predictability of software development and deployment important in such projects? Speed has become one of the critical aspects of software development. For sure, speed needs to be balanced very carefully against the minimum quality standards that you want to ensure. The speed of work within a project can have two types of impact. One is obvious: speed in terms of time to market. Being quick and being early on a market will result in early and valuable experiences for the customers. These experiences may contribute to building up a USP. The other type of impact results from the fact that speed also has an internal signalling function. Tangible results in the early stages of a project (again, given a good quality standard) can turn internal critics into enthusiasts and enforce further change and innovation. Predictability is an aspect of the above-mentioned minimum quality standard. It is a core issue in building trust internally and towards future customers. On-time deployments and adherence to the schedule should be a top priority. It is usually less important for the project itself – instead, the lack of predictability opens a frontline for (internal) critics, which should be avoided by any means. There’s room for innovation everywhere, even in the seemingly (or stereotypically) traditionalist and formalist environments of large financial institutions. The key takeaway here might just be that going against the current when working with corporations is pointless. A much better strategy would be to move with it and learn from the organisations you work with, to the benefit of both sides.